I want to offer prayers regularly but my office infrastructure does not have any wudu (ablution) arrangements. I can't wash my feet and that is my main doubt. Is my prayer valid without washing my feet or not? Can you do wudhu at home and not break it until prayer time(s)? 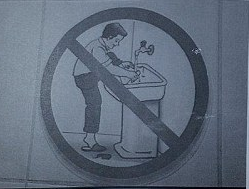 Anyway you are concerned about how to wash your feet in a sink and not be spotted by another? You will just have to explain but someone could object. An option is to use the disabled / handicapped toilet where you can do wudhu in private as the sink is in the cubicle. Otherwise do wudhu at home before leaving for work and put on socks in the state of wudhu. Then you can wipe on them instead of washing the feet in the office gents. That won't be an issue. If you have other Muslims at your job ask them what they do? Some offices have shower facilities - you could do wudhu in there in privacy just collect some water in a jug and pour it instead of using a tap. Or run the shower slowly if possible. Most workplaces should allow you to do that, and of-course on your part you should be respectful and make sure that you properly clean the sink before leaving. You can fill up a small bottle with water and use it to wash your feet in a corner of the washroom, where there is a floor drain. Indeed where there is no other choice you may even use the toilet area to do this, since the need for Wudu and Prayer is greater than need for purity of the surroundings. I have the same issue. I do wudu as normal except for feet. Then I take 4 paper towels, wetten 2, and put these in the other 2. I then put all of them in my pocket. When I get to the place to pray (we have a prayer room), I take my shoes off and wipe my feet with the wet paper towels (make sure you get the heels). The Shafi interpretation says that if you put socks on after your morning wudu when you do wash your feet and keep shoes over your socks throughout the day once you leave your home, then all following wudus throughout the day only require a wipe over the socks for wudu. Socks were not used during our prophet's time so cleaning the feet must have been required for cleanliness purposes. Also if we closely examine the ayah in pertaining to wudu in the Quran 5:6 it qualifies with "when you rise to prayer". This qualifies the morning (fajr) prayer since the rest of the day we are already arisen. So the wudu in its entirety including full washing of feet are for the fajr prayer. You should wash your feet for every wudu if you can and is practical, but the shafi sect interpretation says wiping over socks is sufficient for all but the fajr salah based on this interpreation of the ayah above. Not the answer you're looking for? Browse other questions tagged salat practical-islam wudu or ask your own question. What is the correct way to wash the feets when performing wudu? Can you do masah / wiping on normal cotton socks? Is it compulsory to wash your feet for ablution when they are clean? How can someone turn to Allah in times of crisis? Is it necessary to perform a seperate ablution before every prayer?